So you planned your vegetable garden down to the very last nook and cranny. You figured out where to place everything and there is no soil unfilled. Are you left wishing your garden was just a bit bigger? What if I told you that you might be able to produce even more using the same garden space. How? Succession planting! Succession planting is basically growing one crop after another. 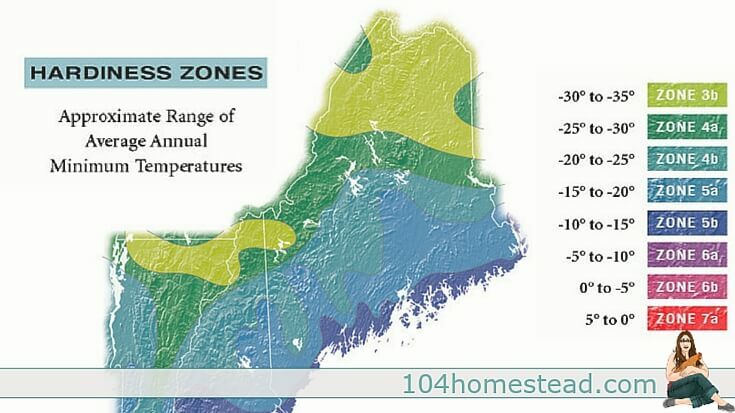 If you live in a warmer climate, you will have no problem achieving this, but even those of us way up here in Maine can do it on a smaller scale. 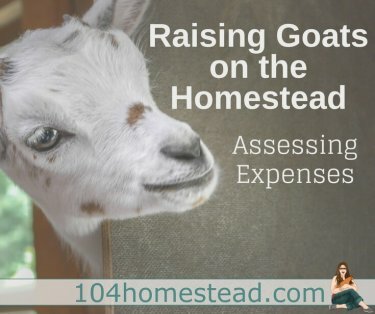 So how do I do succession planting? You’ll want to know your first and last frost dates and you’ll want to read your seed packets. On your seed packets, you will find information about when to plant in the spring, how long it takes for the plant to reach maturity and whether or not the plant is frost tolerant. With this information in hand and your estimated frost information, you can figure out if a crop can be succession planted. A little math is involved, but I promise it’s not too hard. We’ll use my home state of Maine (garden zone 5b) as our example. In Maine, the last frost usually falls on May 15th and the first is usually around September 26th. After singing “the days in the months” song in my head, I can confidently report that there are approximately 136 days in my growing season. With this information, I can start reading my seed packets and figure out what I can plant. Carrots need to be sown directly in the soil. The packet says that my Scarlet Nantes take 80 to 120 days before they are ready to be harvested. These carrots are not good candidates for succession planting in my zone. That would only leave me with forty something days left and part of that would need to be used to prepare the beds for the new crop. A good example of succession planting which I plan to do this year is following my broccoli crop with spinach. It is perfect for the colder zones because not only is broccoli a fairly fast crop, but spinach can deal with a light frost. Broccoli is often started in a greenhouse or via Winter Sowing around here so it gets a head start by about a month. 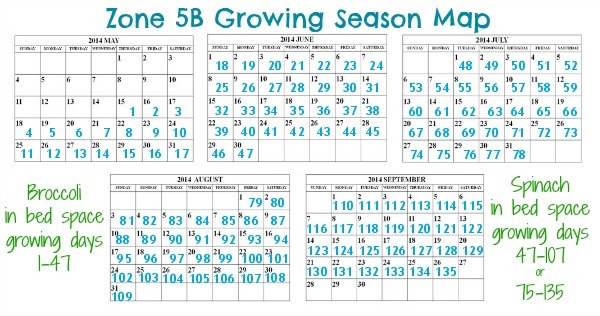 With 60 to 80 days until harvest, it only needs to be in the ground for 40 to 50 days. If I put them out on May 15th, they should be ready between June 25th and July 5th. That means I still have three months of frost-free weather for another crop. I couldn’t do broccoli again, but I could do something entirely different. Here is where reading your seed packets comes into play again. Look through your seeds for ones that don’t need a cold period to germinate. Look for seeds that can handle a little frost in case it comes early. This is where my friend the spinach comes in handy. Spinach is direct sowed and takes about 60 days to go from seed to harvest. Like I said, it handles light frost, so even if we had an early frost, I’d still be fine. Notice how I figured out the spinach bed space planting it right after the broccoli has harvested as well as timing it to come out at last frost. It seems a bit tricky at first, but I promise that once you get the hang of it, you’ll fall in love with the use of succession planting. Remember that growing produce is not a one-time thing. You don’t need to put seeds in in the spring and then be done. It can be something that evolves and changes all season long. Thank you for simplifying this concept and making it more visual. Great question and I’ll do my best answering (as much is a feeling and trial and error). First, the easy question: I do start my first round of seeds early to give them a head start. I use Winter Sowing to start everything except lettuces, carrots, corn, and potatoes. If I don’t start these things early, they don’t get that jump on the season that they need to reach maturity. I often direct sow the second round unless it’s something I have trouble getting started. For example, if I am doing a later crop of bush beans, the heat from summer tends to toast them before they get going. I’ll start those indoors a month before I intend to pull out the first crop and start the second one. In regards to good candidates for succession planting, that’s where past experience, and trial and error come into play. A safe bet for getting started is staggering your plantings of one crop. For example, my kiddos love sweet peas. I will start a bunch as soon as it’s safe to start them outdoors, but I will space them further apart than what’s recommended on the packet. One month later, I’ll plant more sweet peas between the ones that are already growing. I’ll repeat that process a few more times. This will assure that we have sweet peas from late spring until autumn. It will also show me how late I can get away with planting new seeds. If my last round doesn’t mature before freezing, I know I can’t plant sweet peas as late as August. Cold-tolerant plants are always a good bet with succession planting. Lettuces, spinach, kale, leeks, collards, cabbage, and chard are great options for filling space after you’ve pulled a vegetable from your beds. These guys can handle a frost and can even be grown under plastic if winter shows up sooner than we expected. Love your calendar for visual people – boy is that ever me! That’s the thing that hangs me up with succession planting. I do it but I never organize it and make it tidy. Thanks for the reminder as I need to go plant lettuce today! I am very visual as well. I need to write things out and sketch them for it all to click. Succession planting s a good topic. However, I think that carrots might actually be a good succession crop for us in the north. Carrots get sweeter if they’re in the ground after a frost. Doesn’t mean they are completely hardy, but cold frames can be used. You are absolutely right Jeff. Just make sure you are checking length of time to harvest as some can be quite long. It may depend on where you live as to whether it’s worth keeping the plant. My plants get one good head and become nearly useless afterwards. The florets are not even worth harvesting and often flower after developing a handful of buds. In my case it makes more sense to put in a more profitable plant after that first harvest. Some will and some won’t. We tried Waltham last year and it headed up once and then sat there doing nothing. I kept thinking it would keep going and sacrificed a lot of time waiting. The only way to know what a variety will do in your area, though, is to try. Now I know to harvest Waltham once in my garden, give the rest of the plant to the goats (in little doses) and plant something else in its place. What do you recommend to plant after Christmas in Daytona, Bch. Fl.? I’m not sure what would be good for your zone. My experience in Florida had little to do with gardening and more to do with… college. Let me hop over to our Facebook page and see what our friends have to suggest.